The International Livestock Research Institute (ILRI) participated in this week’s UN High-Level Political Forum on Sustainable Development (follow the proceedings on Twitter with #HLPF2016). This meeting is the first of many meetings and processes that will take place to monitor progress in meeting the United Nations’ 17 Sustainable Development Goals (SDGs). Shirley Tarawali, assistant director general of ILRI, is in New York this week to take part in a livestock-focused side meeting, which took place yesterday evening (20 Jul 2016). A plant scientist by training who has spent her professional life working in research-for-development partnerships to help Africa’s small-scale farmers upgrade their agricultural practices, Tarawali is passionate about the theme of the forum, ‘No one left behind’. She’s also passionate that ‘livestock’—as an agricultural sub-sector, as a livelihood of most of the world’s poorest people, as a provider of nutritious foods for the malnourished, and much else—not be left behind in the many agendas being put forward to meet those 17 goals, all of which, Tarawali will tell you, rely directly or indirectly on sustainable livestock futures. Tarawali was one of five panel members who gave a short talk to frame the following discussion. The other speakers were Dyborn Chibonga, CEO of the National Smallholder Farmers’ Association of Malawi; Jackie Klippenstein, vice president for Industry & Legislative Affairs at Dairy Farmers of America; Martha Hirpa, managing senior director at Heifer International; and Franck Berthe, leader of the Livestock Global Alliance that is facilitating joint communications of five of the world’s leading organizations focusing on global livestock issues. The essay that follows is based on Tarawali’s presentation at this livestock event. social behaviour crosses a threshold, tips, and spreads like wildfire. I’m going to make the case that decisions made today about livestock will be critical for attaining the Sustainable Development Goals (SDGs). I’m going to argue that we’re not going to manage to feed and nourish the whole world without paying greater attention to livestock issues. That we’re not going to rid the world of pernicious poverty; or conserve our lands, soils and water; or stop the next animal-transmitted global human disease, without paying greater attention to livestock issues. I’m going to argue that we risk leaving many people behind—many hundreds of millions of people—if we continue to fail to invest in, and work together on, livestock issues today. 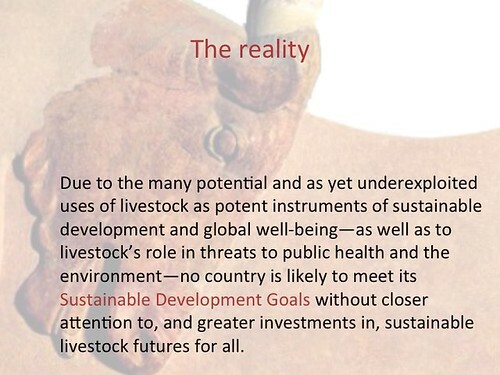 Livestock development for the SDGs is a huge opportunity. An opportunity that was in danger of being missed until the recent launch of a livestock report on Sustainable agricultural development for food security and nutrition: What roles for livestock? by the High Level Panel of Experts on Food Security and Nutrition, which advises and serves as the science-policy interface of the United Nations Committee on World Food Security. It’s not too late to employ livestock as powerful instruments of sustainable development, but we must act now; playing catch up by trying to put livestock on sustainable and equitable paths in future years will be exorbitantly expensive and very difficult, if not impossible in many regions. Let me share some examples of just how much livestock is already contributing to sustainable development. Within agriculture, the livestock sector is the fastest growing, the most controversial and the most diverse. Demand for meat, milk and eggs is sky-rocketing. By 2050 the world’s total dairy and meat requirements will double those in 2005—totalling almost 1 billion tonnes a year of dairy products and half a billion tonnes of meat. Almost all of this rising demand is occurring in low- and middle-income countries; in Africa, for example, the livestock sector is growing 2% annually, whereas in the US the sector is growing less than half a per cent each year. This so-called ‘livestock revolution’ is occurring because of the developing world’s growing populations, with many people moving to the city and earning more income, making them newly able to afford to add a little milk, meat and eggs to their starchy diets. Such modest consumption of animal-source foods greatly improves the nutrition, health and well-being of poorer people in poorer countries, whose diets have relied mostly on cheap grains and root crops. But nutritional inequities will remain. 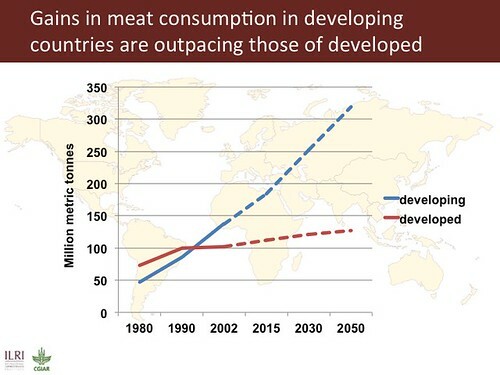 In spite of such global dietary shifts, per capita consumption of animal-source foods in developing countries is expected to remain just a third of that in the US in the coming decades. Given the negative news we often hear about livestock—that they emit greenhouse gases, for example, or can pollute land and use excessive water, or can cause food-borne and animal-transmitted diseases in people, or can contribute to obesity and related health disorders—an increase in global demand for meat, milk and eggs, and the increase in livestock production to meet that demand, might sound like bad news. 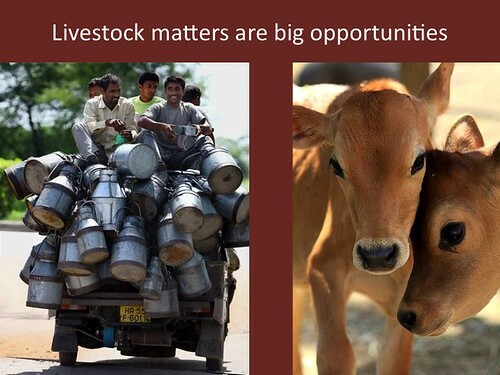 And it could well be bad news if an appreciation of the diversity of the livestock sector is not taken into account. Because in that great diversity lies many big opportunities for more sustainable development. production units of tens of thousands of chickens? mechanized dairy feeding and milking parlours? In those latter examples, which is where the demand for milk, meat and eggs will be greatest in the coming decades, the current source of these products are many millions of smallholder farmers and pastoralists. Some one billion people today depend in one way or another on farm animals for their livelihoods and food; livestock also provide them with a regular income from sales of milk and eggs, with manure and traction for growing crops, and with four-legged assets that serve as insurance against crop failure and other shocks. 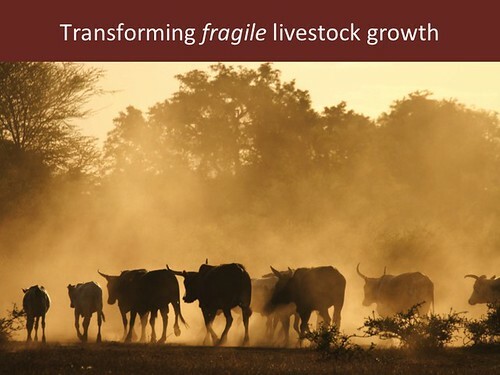 Transforming these small-scale livestock production systems to help meet the rising demand for animal-source foods is an opportunity to simultaneously address many dimensions of sustainable development. Let’s look at three. While many of the world’s richer people could improve their health and environments both by reducing overconsumption of animal-sourced foods, many poorer people would improve their nutrition by consuming a bit more of these foods. Simply adding a daily glass of milk or a single egg or a very small piece of meat to the diets of malnourished children, for example, significantly improves their physical and cognitive development. And because livestock are central to smallholder cropping—with about half of the cereals in the developing world produced where mixed crop-and-livestock agriculture still predominates—animal agriculture also remains key to crop production and consumption. Animal agriculture is where a large part of the developing world’s agricultural action is: in the world’s fastest growing economies, livestock contribute at least 40% of agricultural GDP. And many of the nearly one billion people who rely on livestock for daily life are women for whom livestock are the sole asset they are allowed to own or manage. Livestock emit about 14.5% of all human-induced greenhouse gases. This amount could be reduced by 20–30% simply by investing in options already available that would make smallholder livestock systems more efficient and productive. Novel livestock insurance products are being piloted to reduce pastoral vulnerability to drought. New incentives are being developed for managing rangelands sustainably and for safely storing a lot of carbon—potentially some 600 MT CO2 eq each year—an amount nearly equal to the carbon emitted by the 3 billion people who travelled by air in 2013. Investments that stabilize pastoral livelihoods in the Horn of Africa and other such regions also tend to reduce conflicts. So we can see that livestock play many positive and critical roles in the lives and nations of the developing world—roles that can be made even more positive with greater support. 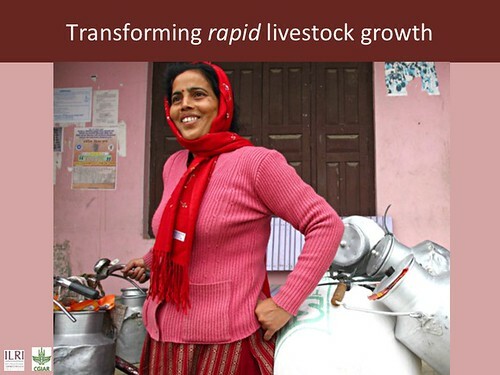 Fortunately, livestock sector actors from both developed and developing countries are joining forces today in global initiatives to use livestock as powerful instruments for creating a more sustainable and equitable world through achieving the SDGs. 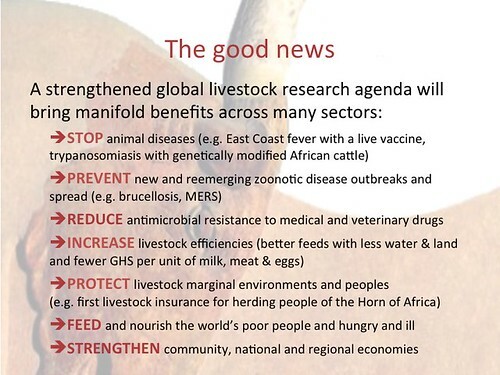 Such livestock initiatives include the Global Agenda for Sustainable Livestock and Livestock Global Alliance. 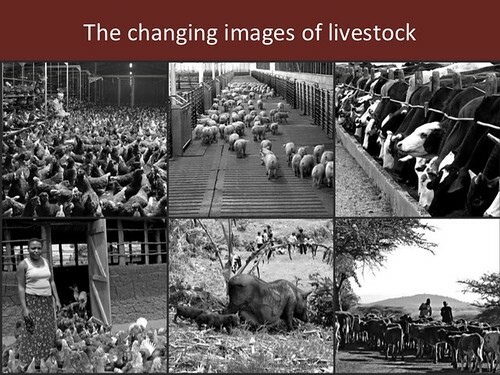 While the many positive roles of livestock can be enhanced, and their negative impacts greatly reduced, by initiatives such as these, and by farmers and herders, of course, and also by governments and international and non-governmental agencies, by investment banks and private companies, by scientists and marketers and consumers, all of these actors and stakeholders in the future of livestock have been waging an uphill battle to get livestock issues the global attention and support needed to ensure that the sector benefits all. That’s partly because many influential and well-meaning people in the world’s high-income countries and regions, no longer familiar with farm animals and viewing the world through a highly industrialized lens, can view livestock as either insignificant or causing more harm than good. The voices of such people, living lives far removed from those living in severe poverty, threaten to drown out the less privileged. We need to change that. We need to broaden people’s understandings and commitments. We need to protect the world against parochial interests and decisions that put the future of all of us at risk. I hope I’ve convinced you that the livestock sector, expanding greatly and rapidly throughout the developing world, is already at a tipping point. Whether it tips for a better or worse world—for a sustainable or unsustainable, equitable or inequitable, future—is now up to us. The High-level Political Forum on Sustainable Development (HLPF) is the United Nations’ central platform for the follow-up and review of the 2030 Agenda for Sustainable Development and the Sustainable Development Goals (SDGs), adopted at the United Nations Sustainable Development Summit on 25 Sep 2015. The Forum, which adopts a Ministerial Declaration, is expected to provide political leadership, guidance and recommendations on the 2030 Agenda’s implementation and follow-up; keep track of progress of the SDGs; spur coherent policies informed by evidence, science and country experiences; as well as address new and emerging issues. This week’s HLPF is the first since the adoption of the 2030 Agenda and the SDGs. It included voluntary reviews of 22 countries and thematic reviews of progress on the SDGs, including cross-cutting issues, supported by reviews made by the Economic and Social Council functional commissions and other inter-governmental bodies and forums. The HLPF also included a range of side events, a partnership exchange event, and learning, training and practice sessions on the SDGs. Tags: Franck Berthe, HLPF, LGA, SDGs, Shirley Tarawali, UN. Bookmark the permalink.